Place the potatoes on a cutting board and cut thin slices in to the potato without cutting through base as if you were creating an accordion. Cover the potatoes in butter and olive oil. Season with the condiments on the list. Bake the potatoes at 425°F for 40 to 60 minutes until the potatoes are cooked and browned. Remove from the oven and serve immediately with fried bacon and chopped chives. You can use any kind of potato: Yukon, russet or red. Hasselback potatoes is a Swedish dish named after the restaurant Hasselbacken in Stockholm, where it was created. 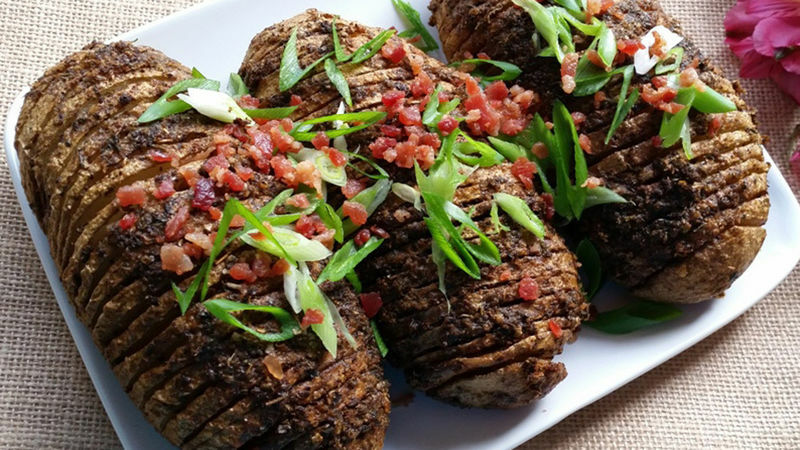 The traditional hasselback potato recipe includes olive garlic powder, herbs, salt and pep-per. These potatoes are so delicious they can be served as a side, appetizer or even for lunch. As you know, I like to be bold in the kitchen, so I’ve taken the traditional recipe to create a version with my favorite Latin flavors. Enjoy!